Franco Ferrari Delfino; translated by Diana and Adalberto Viggiano. 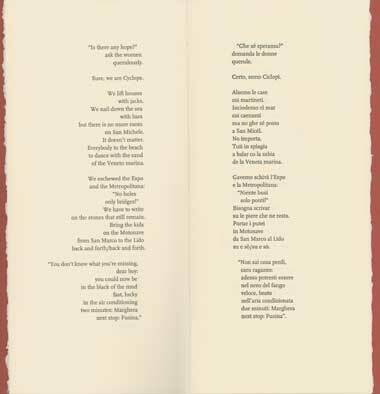 A poem celebrating Venice and the complaints of its inhabitants written in Venetian dialect with an English translation on facing pages. Franco Ferrari, a life-long inhabitant of Venice, pokes gentile fun at his fellow citizens of the Serenissima. Tall, narrow, pamphlet printed letterpress on Rives paper by Susan Filter under the direction of Peter Koch. 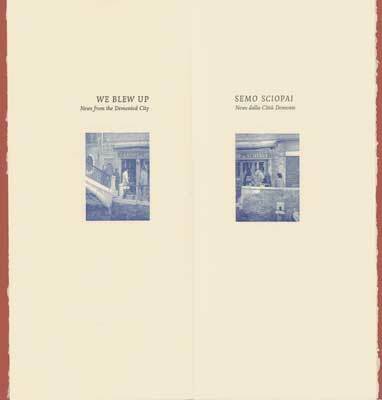 Two text illustrations of the Venetian neighborhood osteria, Già Schiavi, printed in blue. The pamphlet is enclosed in an Aragosto red Fabriano Ingres printed wrapper.